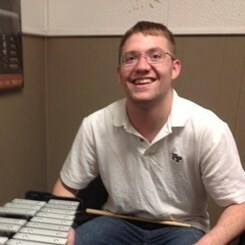 Chris is currently completeing his Bachelors of Music in Percussion Performance. He has been an active performer around the State of Connecticut for the past 8 years with a number of different groups in various venues including Toad's Place, The Webster Theatre, and Stella Blues. Chris teaches and performs a wide range of musical styles including blues, funk, jazz, metal, and rock. Request Lessons with Christopher Adams today!